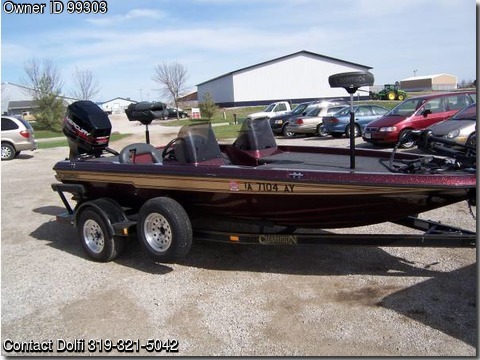 Please call owner Dolfi at 319-321-5042.Boat Location Lisbon, Iowa. BOAT OWNER'S NOTES: For Sale: 1996 Champion 181SCX Elite fiberglass boat in Very Good condition, call boat owner Dolfi @ 319-321-5042. OVERVIEW: All Champion boats are noted for their smooth ride, Even in rough water, it will glide over the waves very easily, This boat has a 25 degree pitch propeller, so it comes out of the “hole” slower, but it's good on the top end, It has dual consoles and plenty of deck space, All instruments work, It does not have a depth finder on the console as it went bad on me and I probably will not replace it as the next owner can put a finder or their choice on it. The carpet and seats are in excellent shape, There is a small tear on the drivers side seat about a quarter inch in diameter, The boat has always been garaged. ENGINE and FEATURES: It has a Mercury 150 EFI outboard motor with very low hours on it, The trailer is a Champion brand with surge brakes and nice aluminum rims with low miles on the tires, Comes with a custom cover for the boat, It has a 74 lb thrust trolling motor with a 2 bank battery charger, The front depth finder is an Eagle III in good condition, but the transducer is located on the back end, One of the bunk boards has wear on it from the boat being put on the trailer, My plan was to replace all of them at some point, All the lights work which include the navigation and those that are located inside the storage compartments, The motor set on a jack plate that would need to be adjusted manually if a person were wanting to raise or ower the motor. FINAL NOTES: The boat, overall, is in above average condition, I am the third owner and I used the boat for bass fishing, I will miss the boat, but at my age I don’t need a boat that goes 60 miles per hour, I rarely had the boat at high speeds for an extended period of time, I have downsized to a smaller boat, I have seen other boats in much worse condition sell for the same amount, so I feel the price is right for its condition. If you have any questions about the boat, call me at 319-321-5042 . Or email me at: dbjkalm@centurylink.net.